Written fully in assembly, no external library for input/output, just interruptions. Internally use a 128 bit representation for holding operators and result. The requirement was operate (+,-) with numbers up to 20 digits, and (*,/) with numbers up to 10 digits. Multiplication using repeated addition operations instead of the native “mult”. Divide by repeated subtraction and counting instead of the native “div”. 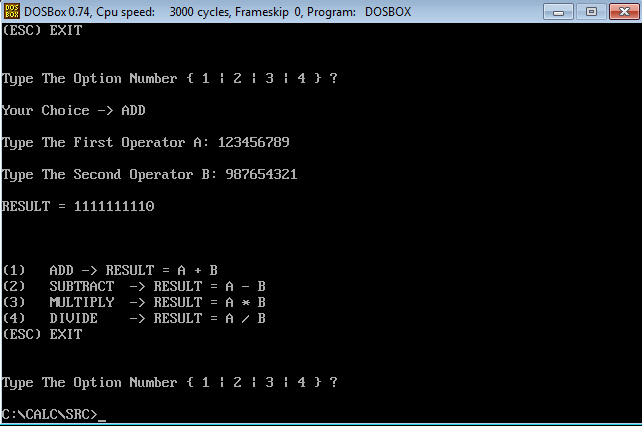 Convert an ASCII String to Binary Number and vice versa. this is required to handle user input, and to display results. Basic Menu in Text Mode. For Example, in this image sequence, we can see a simple addition. Calculator after execution of a addition operation. Calculator after execution of an addition of two large numbers. Some of the functions used for this project. 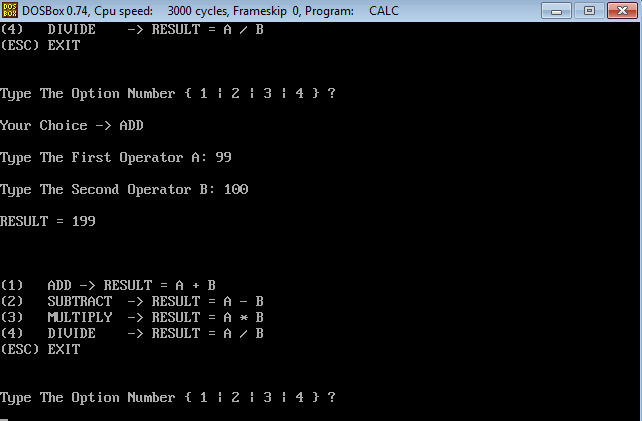 this function just read a key from the keyboard and puts it’s ascii code on the AL register. this function takes the address of any string and display on screen, the string must end with a “$” character. Msg1   DB "(1) ADD -> RESULT = A + B $"
this fuction just aggregate the standar Write with the predefined CRLF string, to make a string with newline. This Video Explain how to Use, Modify and Rebuild the Source Code. 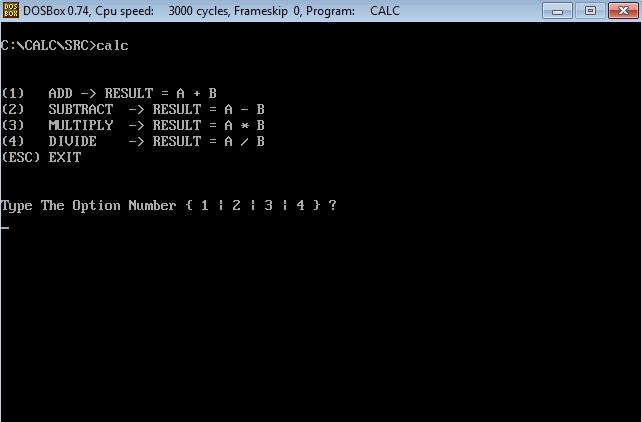 This entry was posted in assembly and tagged assembly, nasm, windows on July 29, 2012 by rudygt.